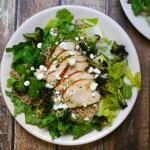 Have you tried adding grains to your salad?? They make salads way more filling and delicious. 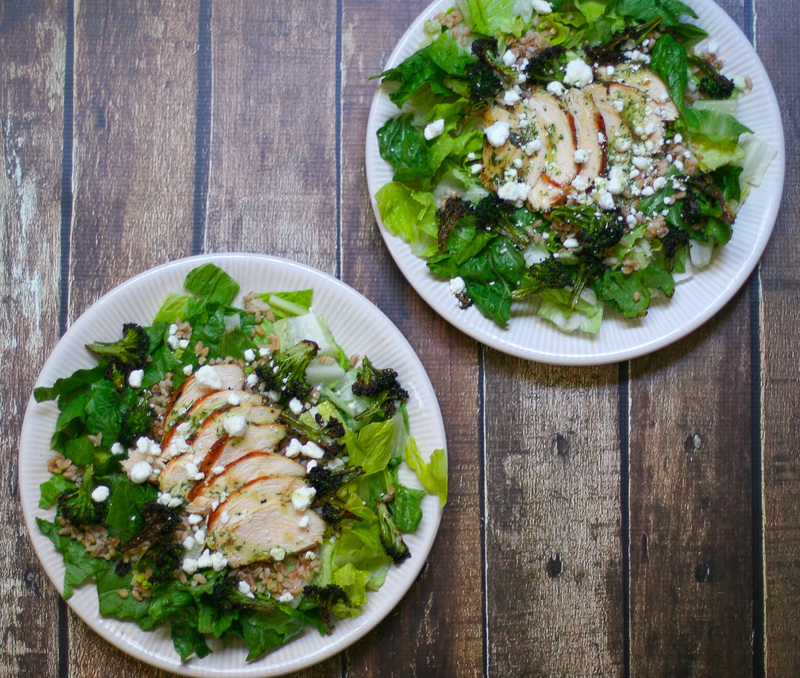 Kind of like a burrito bowl… but SALAD. 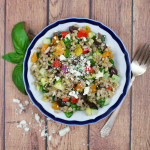 One of my favorite grains to add is farro. Farro is a delicious & tender wheat grain that cooks quickly & soaks up the flavor of whatever you cook it in. If you just boil the grains in water, you’ll end up with bland, tasteless grains that won’t really add anything to your salad. But if you add aromatics to the cooking-water, like garlic, bay leaf, & fresh herbs, you’ll infuse the grains with a punch of delicious flavor. In this recipe, I simmered my farro in salted water with a few smashed cloves of garlic & a bay leaf. It might not sound like much, but you can REALLY taste the difference. So, I know it’s mid-winter, but I think I’m craving summer barbecues, because I decided to pump this salad up with smoky-charred flavors. Charred broccoli & grilled chicken. I LOOOOVEEEE grilled things. That smoky flavor reminds me of summers by the pool, family get togethers, and worry-free afternoons. I can never get enough. 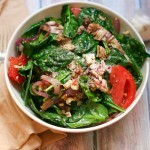 Plus, adding grilled meats & veggies makes the salad feel more like a hearty meal. Sprinkled with creamy tangy goat cheese & a bright dill vinaigrette, this salad is perfectly balanced and uh-mazingly delicious. Place the chicken breasts in a large ziplock freezer bag or glass/pyrex dish. Add 1/4 cup extra virgin olive oil, 2 tablespoons white wine vinegar, 1 teaspoon Dijon mustard, 1/4 cup parsley, 3 sprigs thyme, 3 cloves smashed garlic, and a liberal pinch of kosher salt and freshly ground black pepper. Seal the bag & shake well to distribute, or if using a dish, use your hands to mix everything together and turn the chicken breasts to coat well. Wash your hands well with soap and hot water afterwards! Seal the bag or cover the dish & place in the refrigerator to marinate overnight or at least 4 hours. When you’re ready to start cooking dinner, place a grill pan or a large heavy bottomed skillet on the stove. Warm over high heat & add the chicken, shaking off any extra marinade before placing on the pan. Grill/cook for ~6-8 minutes per side, until nicely charred & the internal temp reaches 165 degrees Fahrenheit. If you have an actual grill, you can also grill the chicken! Remove from the pan/grill and set aside while you prep the rest of the salad. Next, fill a medium saucepan with water, add a generous pinch of salt, and bring to a rolling boil. Add the farro, 3 cloves crushed garlic, and 1 bay leaf. Reduce the heat and simmer for about 20 minutes, or until tender. Drain, remove the bay leaf and garlic cloves, and set aside. As the farro cooks, preheat the oven to 425 degrees Fahrenheit. Spread the broccoli florets on a large rimmed baking sheet, drizzle with olive oil & season well with salt and pepper. Toss to coat & spread the florets out evenly on the baking sheet. Bake for roughly 20 minutes, until the florets are nicely charred. Remove the broccoli from the baking sheet and place on a plate to cool. In a mini food processor, add 2 tablespoons fresh dill, 1 clove peeled garlic, 2 tablespoons white wine vinegar, 1/2 teaspoon Dijon mustard, 1/2 cup extra virgin olive oil, and few cracks of salt and pepper. Blend until combined, and pour into a small bowl. 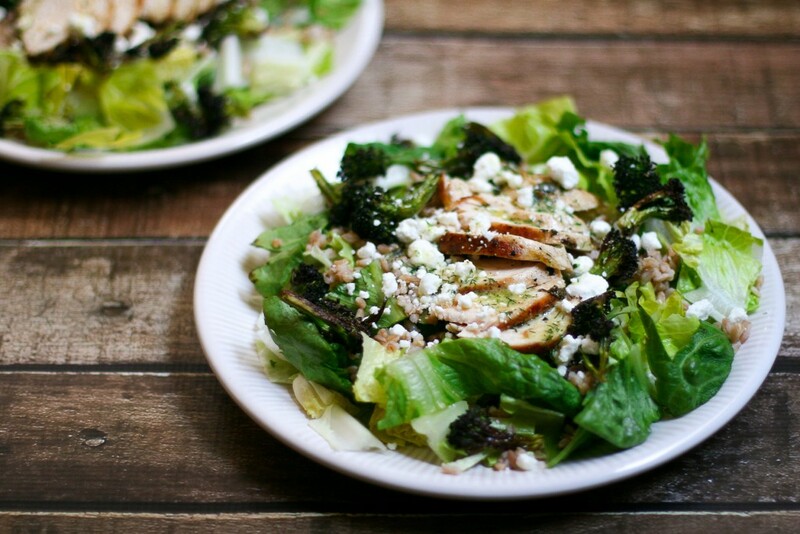 Chop the romaine, wash well, & spin dry with a salad spinner. 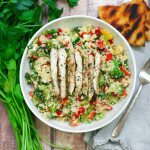 Slice the chicken breasts into thin slices, get out serving plates or bowls & get ready to assemble the salads. 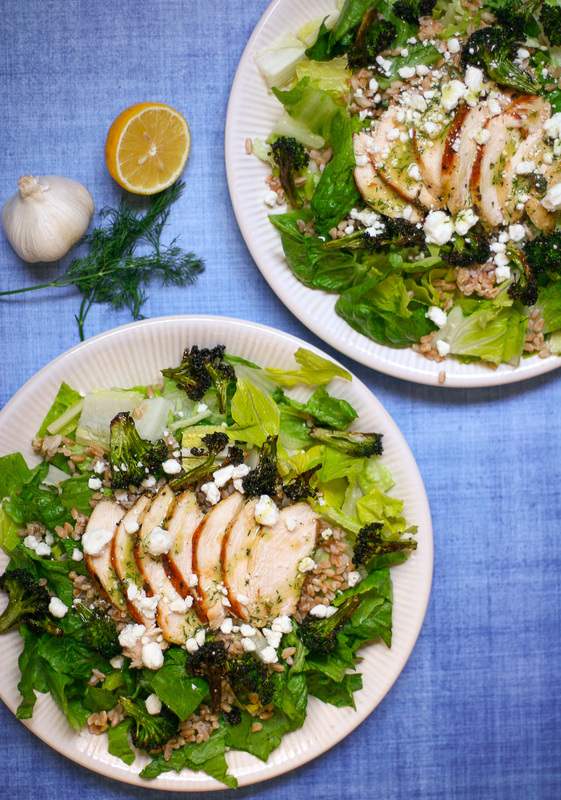 Start with a bed of lettuce on each plate, top with a few generous scoops of farro, slices from 3/4 of a chicken breast, 1/4th of the charred broccoli, and 1/4th of the goat cheese. Drizzle generously with the dill dressing and enjoy!